I’ve been on a weight loss/healthy eating journey for awhile now. For the past few months, my go-to, fav breakfast is a green smoothie. It’s filling, low on calories, and pretty inexpensive to make! All you need is a blender and it doesn’t have to be a super expensive one. Mine is a black & decker that I got from Walmart for around $30. Although I’d love to have a Ninja or Vitamix, the B&D works just fine! I’ve found that the secret to the perfect green smoothie is to break down the greens with water on pulse in the blender first before adding the rest of the ingredients. First, toss a handful of spinach in the blender and add 4 oz of water. On pulse break the greens down for a few seconds. Next add the rest of the ingredients. I’m guilty of not measuring, but add a handful of fruit, 4 oz of OJ, and a little flax/chia seed. I use Trop 50 OJ for less sugar and calories. Another thing I’ve found that makes the consistency better is to blend for a few minutes. It may seem like a long time, but the longer I blend, the better my smoothies turn out! I make this the night before and it still tastes yummy the next day! Let me know what you think! 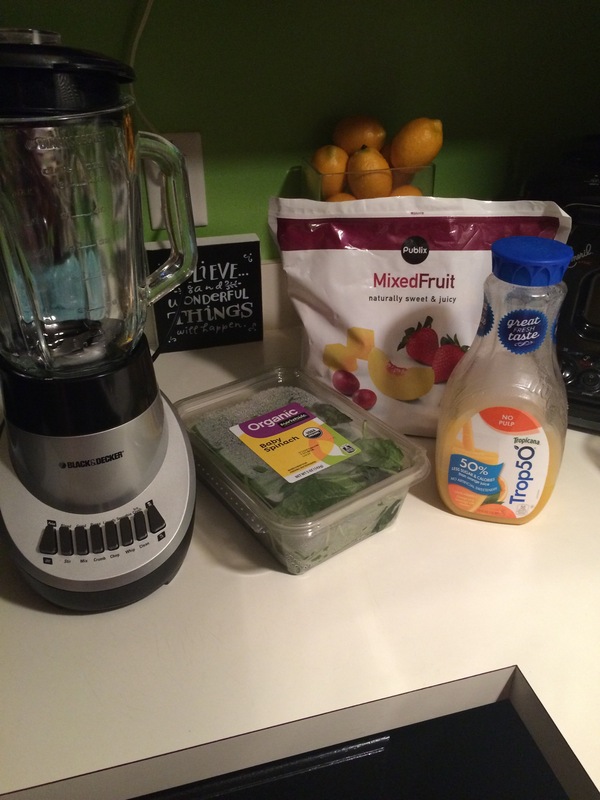 Do you have any fav green smoothie recipes? Thanks for sharing, Ms. Kindra! I will be trying your recipe this week!